Branding is about more than image recognition for customers. Great brands give their customers something to belong to and talk about. They always have a great story. I was reminded of that last week while in Ontario cottage country visiting relatives and friends before returning to Toronto for some business meetings. The town of Magnetawan is nestled between Lake Cecebe and Ahmic Lake in the heart of Ontario cottage country, about an hour north of Muskoka. While the once proud marina, restaurant and general store have all burned down under separate incidences and shady circumstances in recent years, from their ashes have emerged new establishments that fill the gap of needs for the town residents and an influx of seasonal guests. The town of Magnetawan, at the peak of permanent resident status boasts a population of 300. It would hardly seem the launching pad of a global brand. But this little town has its own shirt, proudly displayed in all caps as DOWNTOWN MAGNETAWAN across the front. The shirts have a great story. And it's a story that can teach us about good branding. If you've been to the Mag, you likely own a shirt. And if you own a shirt you share the same story and knowledge of the place with others who have been there. Downtown Magnetawan is of course an oxymoron. You could blink and miss it, but that's the point. For years the Downtown General Store sold the shirts. It was the kind of place that proudly boasted "If we don't have it, you don't need it" which pretty much summed up their approach to retailing. They had it all. Including the sought after shirts at the front, and a shrine of photos that people had sent them, sporting their shirts in places all over the world. Even former U.S. president Jimmy Carter was pictured wearing one. 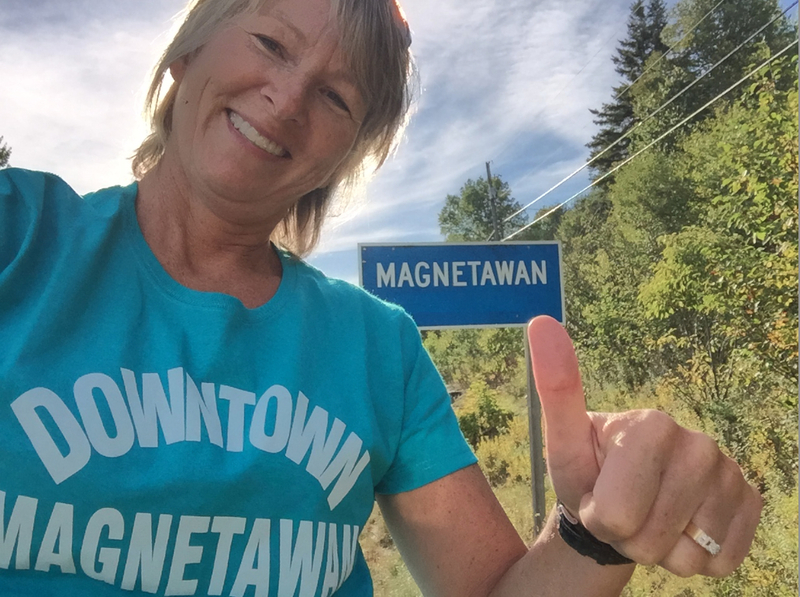 On two occasions, once in France and the other time in New Zealand, while wearing a Downtown Magnetawan shirt, I had a complete stranger run up to me and tell me they'd been there, which then provoked a conversation of our experiences anchored in this little town. Those that wear the shirt have a shared story. They're members of a global tribe. And they always have an emotional connection to the place and their time there, whether it be square dancing in their bare feet at the community centre on Saturday night, cruising down the lake in an old wood launch, or simply coming to town for an ice cream. Unfortunately the General Store burned down in 2011, and with it the shirts, and the shelves of photos of people wearing them from all over the world, methodically collected and display over the years. In a curious twist of small town politics, the trademark to produce them remained dormant for five years, further adding to the story. Those that had a shirt then became part of history briefly locked in time. Thankfully this year the Home Hardware store in town acquired the rights to produce the shirts once again, and they are now proudly building up that photo shrine, selling the shirts in store and online, as well as helping people share their stories and photos through a Facebook page and the use of hashtags on Twitter @DTmagnetawan and Instagram. So what's the learning in all this? 1. Great brands always have a story. Downtown Magnetawan shirts had humble beginnings in a small town, and became a global brand simply through brand ambassadors wearing them in their travels. That's a cool story. 2. Secrecy adds value. If you've been there you will understand the absurdity of downtown precluding the name. The shared humour in that is the secret. Many people also have a hard time pronouncing Magnetawan. It's right up there with Penetanguishene. But those who have been there can say it, and often refer to it simply as "The Mag." Fellow tribe members of course, understand. 3. Give people a way to share their story around the brand. For years the photo shrine helped tell the story of Downtown Magnetawan shirts worn across the world. Now those stories are also told through online platforms such as Facebook, Twitter and Instagram, where tribe members post photos and share stories. A story and a secret, and a way to share it among members of the tribe: could great branding really be that simple?